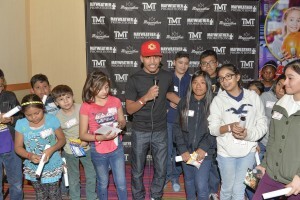 The Floyd Mayweather Jr. Foundation strives to empower community alliances, impact youth leadership, promote health and wellness, and strengthen family foundations through community development, entrepreneurialism, and education resulting in a wholesome community. First and foremost, Happy New Year to our readers! We are pleased to present our first TFMJF Fan Connection of the year. Our goal is to keep you informed, and we welcome readers to use our newsletter as a resource to learn about healthier living, staying active, educational opportunities, and ways to get involved with our events by either supporting, attending, or volunteering! Share this with friends and family so we can work together as a team in making the greater Las Vegas area a better place for our children and families. We believe that keeping everyone in the know is a crucial part of the overall well-being of the communities we serve, while adhering to TFMJF’s formula of continued success. Enjoy! We are looking forward to hosting another year filled with events, while we strive to promote community empowerment and youth leadership.. Read more below about the events we will be hosting in 2017 and how you can get involved. 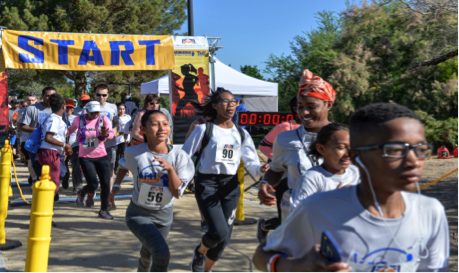 For the third consecutive year The Floyd Mayweather Jr. Foundation will host its Annual Fight-4- Fitness: 5K Race, 2K Walk, KIDS FUN RUN, & Community Day. 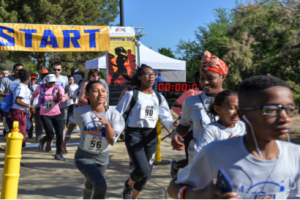 Our past events have brought in support from over 300 families in the Las Vegas community, who have joined us in promoting the importance of leading a healthy lifestyle. 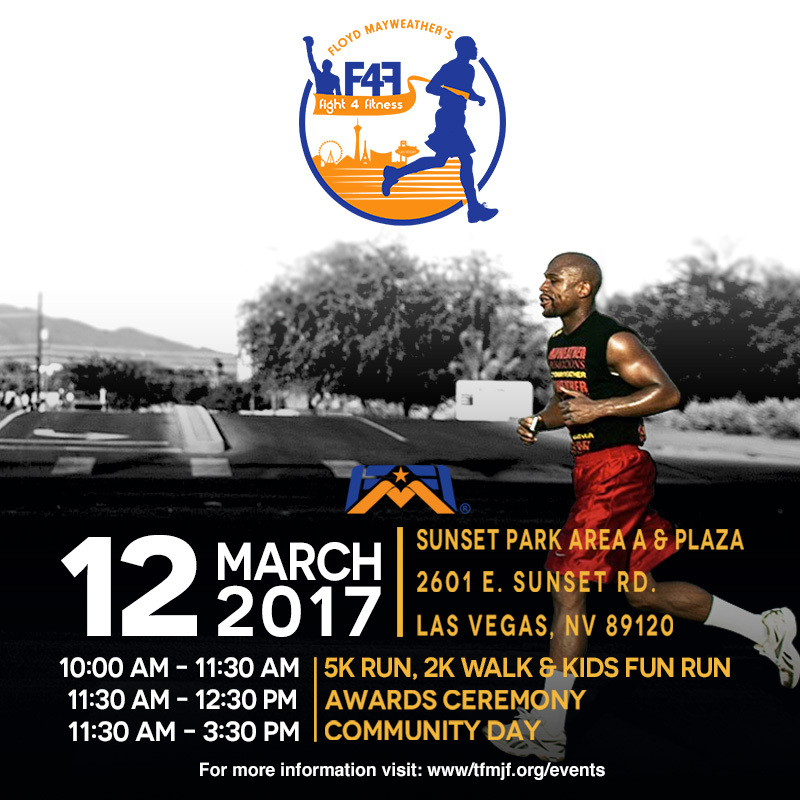 This year’s Fight- 4- Fitness will take place on Sunday, March 12, 2017 at Sunset Park in Las Vegas, Nevada. 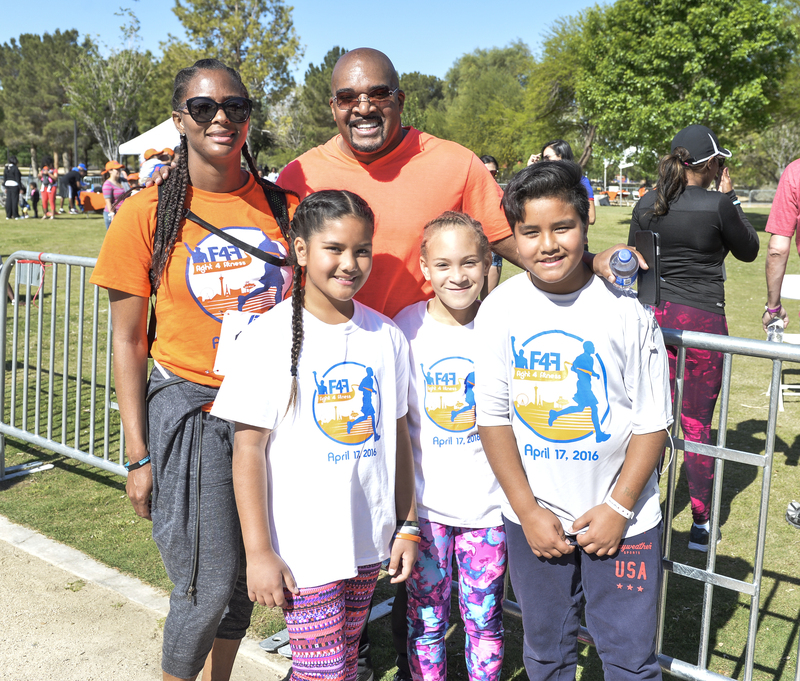 The festivities will be kicked off with the 5k race & 2k walk followed by the KIDS FUN RUN, and an awards ceremony for our participants. Community Day will immediately follow the awards ceremony, and will include various activities such as: interactions with our fighters, activities, entertainment, raffles, food, plus more! Our goal is to continuously promote healthy living and physical fitness, while forming community alliances. Take advantage of our early bird pricing and join the “fight” here or contact fight4fitness@tfmjf.org for additional information. Be sure to follow us on social media to receive updates on events, volunteer opportunities, and news @tfmjf on Twitter and Instagram, www.facebook.com/tfmjf on Facebook! Last year, we ended our summer with a bang by providing over 600 students with an equal opportunity for success. With the help of our generous sponsors, we hosted our biggest Back2- School event yet and provided students, K-12, with backpacks that were filled the necessary supplies needed for a successful school year raffles that offered everyone in attendance the opportunity to win various prizes, which included: laptops, desktop printers, dictionaries calculators, along with many other educational must haves. 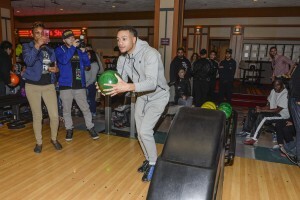 The event was also comprised of family-friendly activities, giveaways, and so much more! The Floyd Mayweather Jr. Foundation Scholarship for the Advancement of Women in Sports & Entertainment scholarship is intended for eligible college undergraduate and graduate school students who are women with the desire to work, and contribute their efforts within the field. Due to the underrepresentation of this demographic in the industry, this scholarship fund has been established with the intent to aid women in furthering their education, encourage their valued participation in the profession, and benefit the industry as a whole. Eligibility: The scholarship in the amount of $1,000 is granted to four applicants annually who are matriculating full-time in their undergraduate sophomore, junior, senior or first year of graduate school. A minimum G.P.A. of 2.75 is required and applicants are required to be enrolled in one of the following majors in order to be eligible: Communication Studies, Marketing, Public Relations, Media Studies or Journalism. If this sounds like something you or someone you know would be interested in applying for, please visit our website at www.tfmjf.org/scholarships for more information and to download the application. The deadline for Fall 2017 submission is June 15, 2017. We would like to congratulate our recent honorees below, for allowing us to shine light on them in this quarter’s newsletter! Passion Statement: I’m not saying I’m gonna change the world, but I guarantee that I will spark the brain that will change the world. As a creative problem solver and communications strategist with a passion for personal branding and entertainment media, I embrace opportunities to work alongside my peers to showcase the diversity of our communities to ensure as a collective that we brand ourselves in our most authentic form. I believe that the most powerful tool my education has afforded me is the confidence to color outside of the lines. Every day is an opportunity to learn about the world and solve challenges creatively. By maximizing educational opportunities both in and outside of the classroom I look to work in team collaborative settings to develop innovative solutions to engage in leading areas of strategy, research and creative conception. Through these experiences I developed an interest in learning how communications campaign and messaging strategy work to identify, clarify, inform and persuade audiences. Knowing the most valuable possession one obtains is their cultural narrative I look to help others find their inner voice to artistically narrate the beauty and meaning behind their life experiences through multimedia platforms. Along my journey of professional development and pursuit of career advancing opportunities in the public relations and entertainment media industry, I have four impact goals – to change minds, influence behaviors, build communities, and revitalize structures. To do this type of work fuels my creative drive as a communications strategist. Passion Statement: Remember your Why. Stay rooted and take flight. Born and raised in Southern California, Melissa fell in love with basketball when she was nine. Player turned basketball manager, she found her passion working on the sidelines and behind the scenes. Her goals have been to get a thorough understanding of the needs and desires that resonate within the basketball community. With this knowledge, Melissa hopes to impact the game through the sports marketing and management fields. She has spent countless hours working in grassroots and high school basketball events like the Las Vegas Fab 48, Hoop Review showcases, the Jordan Brand Take Flight Challenge, and adidas Nations. Those events have introduced her to mentors who have taught her countless life lessons and continue to fuel her drive. She recently spent her summer working as an intern for the Las Vegas NBA Summer League and considers it a once in a lifetime experience. Now in her early 20s, Melissa is currently studying Advertising and Public Relations at Pepperdine University. She is a basketball manager for the Pepperdine Men’s Basketball Team and a Resident Advisor for the school. 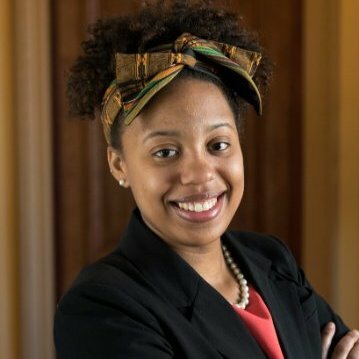 She aspires to work for the NBPA’s and WNBPA’s Strategy and Development teams to help service players on and off the court. Maintaining a healthy lifestyle requires a combination of proper personal care, a healthy diet, and proper exercising. We know that there are many ways to reach our healthy lifestyle goals, and we want to use this section to share ideas that are practical for most to maintain. We compiled a list of healthy tips for you to incorporate into your daily regime that are sure to get you one step closer in living a healthier happier life. Did you know sitting for lengthy periods of time every day is considerably more stressful and sedentary than it was just ten years ago? It’s no secret that we live in the technology era, so the days of getting up to answer the phone or make a mail run are nearly over; you can even lock your home, control your home’s internal and external lights, and other things such as security systems remotely through a phone app! Although technology has allowed us to be more efficient in our day-to-day activities at work and school, spinal movement is nearly eliminated for hours at a time. Therefore, our back takes much of the toll. 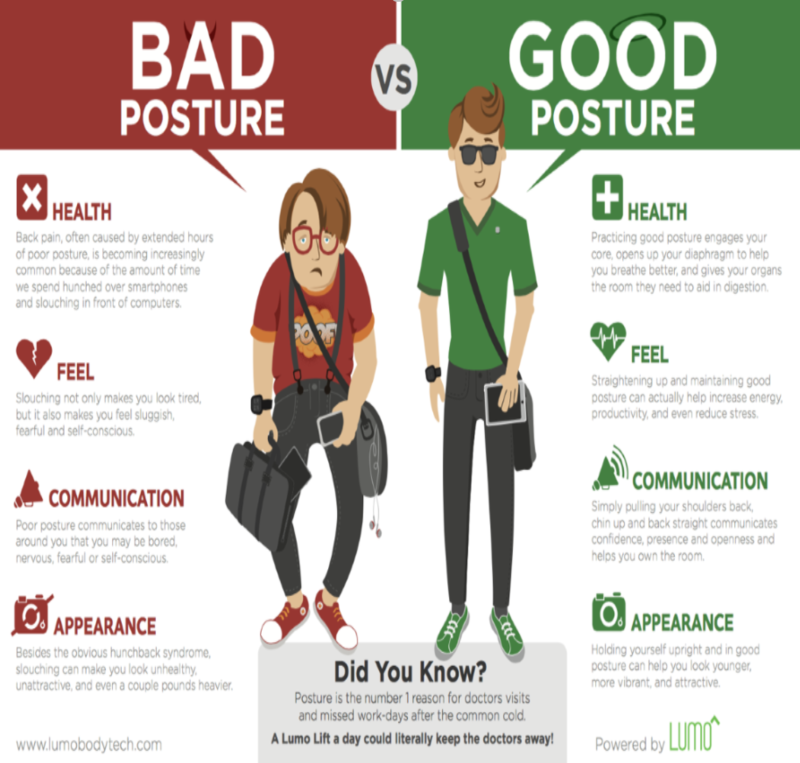 Below are a few practices you can apply to eliminate bad posture and spinal problems down the line. Deep Breaths: Poor Posture (hyperkyphosis) invites distorted, restricted, shallow breathing and a host of other problems. Movements such as: diaphragmatic breathing (deep breathing from the belly) regularly practiced in yoga can help you breathe better allowing more air in, and increase chances for a better posture. 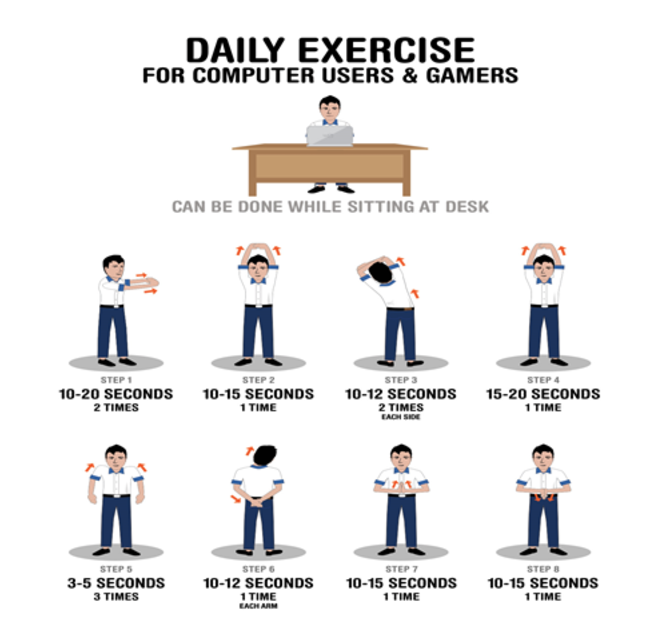 Deskercise: Shoulder rolls, neck circles, bending over, and head to the floor stretches are all great exercises you can do from sitting at your desk also known as “deskercising”. Seat Alternatives: Buy an exercise ball, which forces your ab muscles to work and will naturally keep your body straight. You can also use a backless stool if you want something a little more stable than an exercise ball. There are many creative ways to maintain the health and strength of your back, and keep you moving while sitting for many hours at a desk at school or work, be proactive and keep moving. Did you know that your feet absorb the impact of your full body weight? 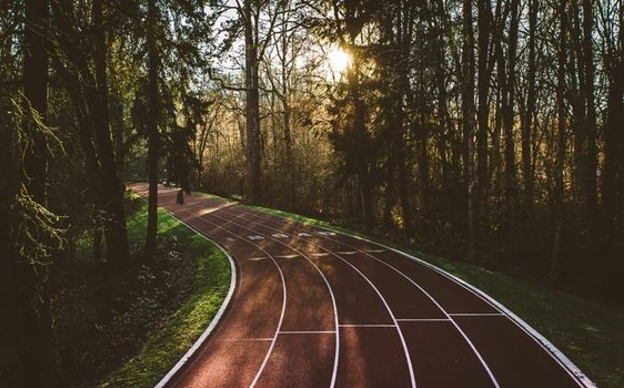 We rely on our feet on a daily basis; every step and facts prove that we don’t think about taking care of our feet until we suffer some sort of injury. We can avoid a lot of foot injuries, discomfort, fungus, and congenital reduced mobility by incorporating simple daily care. Selecting shoes that fit and are made of the right material such as leather and cotton will help keep your feet cool and release moisture, among other things. Ladies, if you wear high heels and plan to walk long distances, prepare yourself by carrying a flat soled sneaker; this can cut down on ankle injuries and broken bones. Use moisture Absorbing Powders: Drying your feet is as equally important as properly cleaning them. Using a good foot powder after towel drying is a good method to help keep your feet dry. Moisturize: Applying moisturizer will help maintain your skin’s good condition. Putting coca butter on your feet along with a pair of cotton socks at night will prevent cracked skin and make your feet much softer. Use the right Protection: Protecting your feet from your everyday foot routine simple as wearing the right sock. If you are an athlete, look for high performance socks made with synthetic materials. If you’re diabetic, never wear open toe shoes and visit your podiatrist for routine nail clippings. We all know how busy life can be. Planning meals isn’t always first on our minds. Some of us have busy schedules that we often choose the fastest solution to match our lifestyle. What we don’t always account for are the consequences that come along with the alternatives to planning meals and eating at home. When you’re hungry, pulling up to a drive-thru makes life so much more convenient and you have your meal in a matter of minutes. The truth is, consuming artificially enhanced products, low quality cheap food has contributed to overweight and various illnesses many Americans suffer from today. Therefore, it is important to plan ahead and make time to prepare your meals in your kitchen. Grab a Morning Snack: a boiled egg, toast, & fruit will suffice, and keep you from splurging on your way to work or school at a drive thru. Be Prepared: Always pack a snack in your backpack or purse. If you have children always keep healthy snacks on hand when you’re out and about. 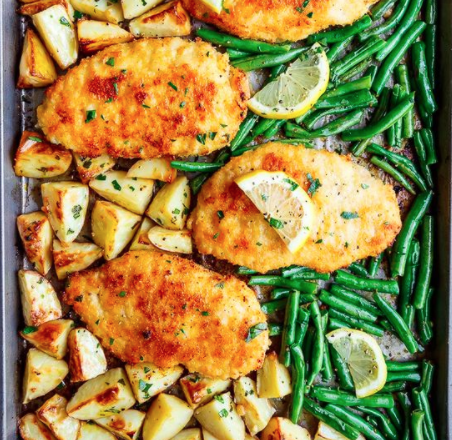 Get the whole family Involved: Get your children involved or your significant other and have a cooking bonding experience. Involving your children will help them learn how to function in the kitchen and the importance of preparing your own meals verses picking up fast food. Meal Prep: Plan meals that can be prepared and stored for consumption over the course of a few days. Do your homework, there is a ton of information on the web. Pat yourself on the back, when you see that you stayed out of the fast food line. As you continue to make healthy choices and avoiding the fast food line you will also watch your piggy bank grow. Make small steps that work for you, and try to increase your activity every week. You will find that your entire life will become rewarding and the best thing you have done for yourself. Last year was an exceptional year for TFMJF! We were able to produce more initiatives to service the Las Vegas community , which enabled us to touch more lives and accomplish our commitment to enrich our community. Together we dedicated our time, and provided resources and programs to unify our fellow neighbors, while creating a positive impact. 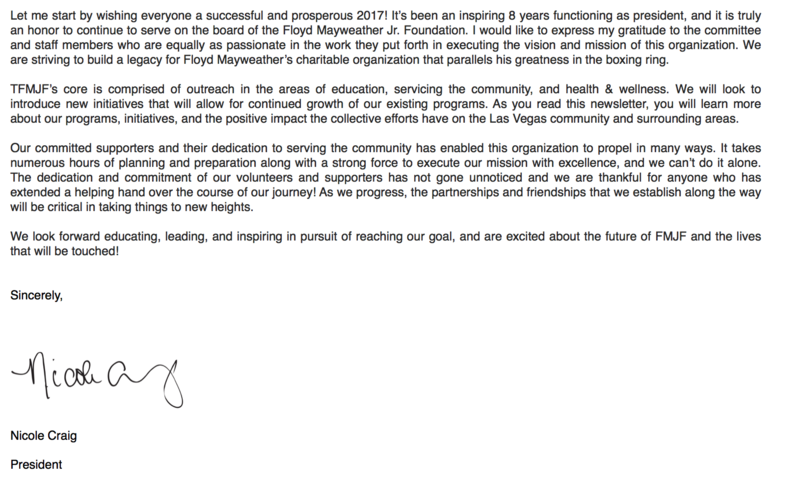 Read below to learn about our efforts and initiatives we successfully engineered in 2016 that made a lasting impact on our community. TFMJF joined Spread the Word Nevada’s Books on Break reading program this past summer. This is a 10-week initiative with a purpose to bring reading and hands on enrichment activities into the community. The program is designed to promote the importance of reading comprehension and development during summer break, while also building confidence and appreciation for reading. Collectively, we were able to visit 4-5 sites, spending a little less than an hour at each location per day. Each session is organized into a small group of young readers who enjoy reading and are given the opportunity to discuss the story of the week out loud with their peers, while every child in attendance chooses a “forever” book that they can take home after each session. One of our young volunteers joined Nevada Ballet’s summer edition of their Future Dance Program. This is a free camp offered to students in the Future Dance program that runs for 4 weeks over the course of the summer. The students experienced instruction in a variety of genres, as well as education and appreciation for the art of dance. 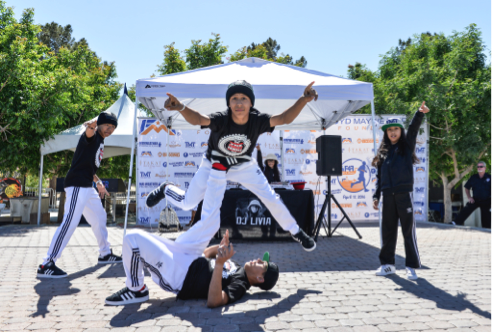 A total of 103 service hours were dedicated to assisting with dance instruction and mentoring the students. On September 23, 2016 our team had the privilege of visiting Opportunity Village, where we toured the facility and met some wonderful people. The humbling experience consisted of spending time in the facility’s three rooms where we were able to observe, and interact with the neighbors who visit the facility on a daily basis to participate in the various programs offered. A portion of our time was dedicated to their a workroom filled with hired individuals carrying out their assigned duties in small teams. Our visit to Opportunity Village concluded with a fun Halloween themed or self-expression themed painting session. We were invited to leave a touch of our creativity behind through our canvas paintings. ABOUT: Opportunity Village is a not-for-profit organization serving children and adults in the Southern Nevada community with intellectual disabilities, to enhance their lives and the lives of the families who love them. Opportunity Village is dedicated to helping people become the very best they can be. Through vocational training, community employment, day services, advocacy, arts and social recreation, citizens with severe disabilities are able to find new friends, realize future career paths, seek independence and community integration and unleash creative passions. In November, with the help of the Mayweather Promotions fighters we gifted 10 lucky fans with gift cards through our #ThankfulThursday & #TakeoverTuesday Giveaways. The campaign was designed as a contest to show our fans and supporters our appreciation. We were able to get our fans involved by inviting them to participate each week in our #ThankfulThursday giveaway where we asked our followers to tag 5 people they are thankful for or the #TakeoverTuesday Snapchat Challenge where they had to follow our story through Snapchat and answer the question of the day asked by our fighters correctly. Our winners were chosen at random, and mailed a $50 or $100 gift card. The response we received form the winners was overwhelming, many of the winners thanked us for helping to provide food on the table and clothes for their family. 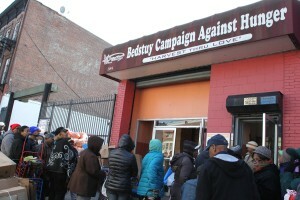 In the spirit of the Thanksgiving holiday, super middleweight world champions Badou Jack and James DeGale, plus former IBF junior lightweight world champion Jose Pedraza and new IBF junior lightweight champion Gervonta Davis, donated and distributed Thanksgiving meals at the Bed-Stuy Campaign Against Hunger in Brooklyn on November 16th, 2016. The fighters handed out 100 turkeys along with other Thanksgiving foods to help aid the organization that has provided millions of meals for people in the area. Hailing from countries all around the world, the fighters got together to give back in the borough that they competed in on January 14, 2017. On November 19th, 2016 we had the opportunity to give back to the city we call home and spread some holiday cheer by providing 100 turkeys to families in need. 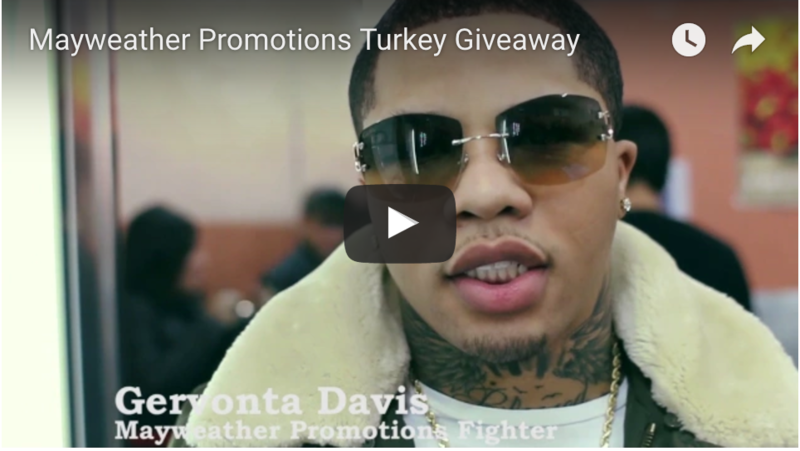 We were joined by: WBC World Champion Badou Jack, Ashley Theophane, Ishe Smith, Kevin Newman, Lionell Thompson, and Charvis Holifield, who all made this event even more valuable to the families who received their turkeys. The Mayweather Boxing Club was packed as families lined up to receive their turkeys’ in time for Thanksgiving Day. This event is part of our community outreach effort to fight against food insecurity in Las Vegas and provide disadvantaged families with a complete Thanksgiving dinner. 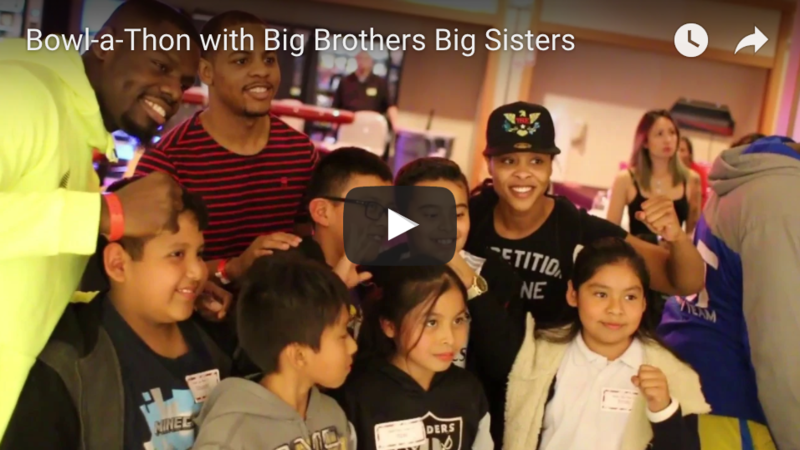 We teamed up with Big Brothers Big Sisters Of Southern Nevada, following the Sin City Showdown Weigh-In to host our first Bowl-A-Thon. 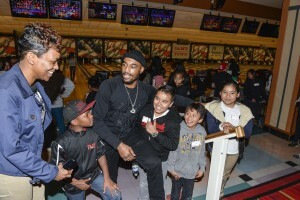 Our Mayweather boxing stars took part in adopting 20 children for a great night of bowling at Sam’s Town Bowling Center. Each child left feeling excited and empowered after spending time with our fighters, who talked to them about the importance of hard work and dedication in everything they apply themselves to. With every event, we aim to incorporate Mayweather Promotions’ fighter’s participation, because they serve as role models who help to educate children and adults in our community on the importance of core values to success. We thank everyone who came out and supported this cause and a special thank you to Big Brothers Big Sisters of Southern Nevada. We look forward to carrying on this initiative and help touch lives of the children in our community. 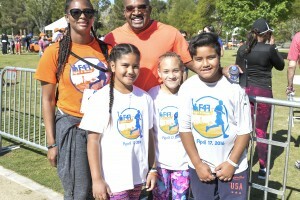 Each year the Floyd Mayweather Jr. Foundation puts on various events within the community in its continued pursuit to promote good health and wellness, strengthen family foundations, encourage entrepreneurialism, and support education. In 2016, thanks to our hard-working staff and dedicated volunteers, we accumulated over 950 community service hours. The hours put in resulted in many successful events and community outreach initiatives throughout the year. Our foundation’s events such as: Back-to-School Supply Drive, Fight 4 Fitness, and others would not have been possible without the help of our community members & supporters. Our efforts to provide for a better community does not stop with the events we put on; we also participate in volunteer programs and activities throughout the Las Vegas community on a continuous basis. We welcome anyone who wants to make a difference to join us in uplifting the community. If you, or anyone you know, is interested in volunteering for events and other opportunities we have available, please submit your name and phone number to contact@TFMJF.org with ‘TFMJF Volunteer Opportunities’ in the subject line. As we roll into 2017, we’re extremely excited and looking forward to a very prosperous year!